The upward growth trajectory and expanded reach of telepsychiatry models remain strong. As telemedicine continues to open new doors to access in healthcare, a bird’s eye view of current trends suggests that behavioral health is the healthcare sector that has experienced the most positive impact. The telepsychiatry market is beginning to mature and industry leaders are emerging and continuously raising the bar. Telepsychiatry plays a crucial role in not only improving the outlook on severe psychiatric professional shortages, but also in aligning with consumer expectations and the evolving demands of value-based care. As healthcare closes the book on 2018, here are trends and changes the industry can expect to see on the telepsychiatry front in 2019. Telepsychiatry has the potential to help address one of the nation’s most significant crises: opioid use disorder. However, policy changes are needed first. In 2019, the Drug Enforcement Administration (DEA) is expected to establish special registration for telemedicine, as required by the SUPPORT for Patients and Communities Act of 2018. The prescribing of controlled substances is necessary for a common treatment of opioid use disorder: medication assisted treatment (MAT). However, current federal regulation—the Ryan Haight Online Pharmacy Consumer Protection Act of 2008—limits the prescribing of controlled substances via telemedicine. By creating the long-awaited special registration for telemedicine in 2019, the DEA will help open doors for the appropriate prescribing of controlled substances via telemedicine, and thus allow for telepsychiatry to help address the opioid epidemic. Additionally, another impactful way the special registration for telemedicine would improve access to needed care is with child and adolescent psychiatry—a discipline where certain controlled substances are the preferred treatment for common disorders such as attention deficit/hyperactivity disorder. Another exciting policy development for telemental health is the Mental Health Telemedicine Expansion Act that was introduced this year, which, if enacted in 2019, would have a significant impact on America’s aging population. The bill would eliminate the originating site requirement for Medicare reimbursement for telemental health services. Currently, there are 8 originating site requirements for Medicare reimbursement, including provider offices, hospitals, critical access hospitals, rural health clinics, federally qualified health centers, skilled nursing facilities, community mental health centers, and hospital-based or critical access hospital-based renal dialysis centers. By eliminating this requirement, Medicare beneficiaries would be able to be reimbursed for telemental health services they receive in their home and other settings. In recent years, the use of team-based approaches like the IMPACT model have proven successful for a wide range of behavioral health conditions. Telepsychiatry helps advance the use of these models by removing the need for care teams to colocate. Providers can conveniently interact and seamlessly deliver care via televideo. Payers are particularly invested in the expanded use of collaborative care models and are increasingly looking for creative ways to partner with telepsychiatry providers or practices leveraging telepsychiatry to achieve the greatest value in care. With the recent addition of collaborative care codes for reimbursement, providers will also be encouraged to incorporate more team-based treatments into care. This piece was written by Holli Stayton, nurse practitioner for Inpathy, InSight’s direct-to-consumer division. Originally published on American Journal of Managed Care. The reality is that emotional wellness can take a downward turn as the start of school approaches. Reminders of school-related pressures are visible as early as midsummer as parents and children are exposed to an array of back-to-school advertising and school-related communication. These activities can cultivate anxieties and tensions well before the start of the new academic year, and it is not uncommon for demand of behavioral health services to soar near the end of the summer as parents identify concerning behaviors and begin back-to-school preparations. A child suffering from undiagnosed depression becomes agitated about the start of school in mid-July. As the weeks progress, parents begin noticing the child has become more withdrawn and is sleeping more. In August, the child becomes combative, lashing out at family members and responding to conflict in irrational ways. The parents determine it is time to seek a psychiatric consult. Yet, when the attempt to schedule an appointment is made, they find out the child will have to wait 2 months for an appointment. During this time, symptoms continue to exacerbate, and the parents are left with few options. Unprecedented demand exists for child and adolescent psychiatric services. The CDC has found nearly 1 in 7 children between the ages of 2 and 8 has a mental, behavioral, or developmental disorder. The statistics for preteens and teens aged 9 to 17 is higher—as many as 1 in 5. Unfortunately, severe provider shortages, especially for child and adolescent specialty areas, are working against this heightened need. Currently, all states lack an adequate supply of child psychiatrists, and severe shortages exist in 43 states, according to the CDC. Some rural areas lack a single psychiatrist, and many behavioral health issues in children go undiagnosed or underserved. For children who have a behavioral health diagnosis, it is important to schedule routine check-ins as part of a proactive approach to managing the disorder. Unfortunately, provider shortages make routine check-ins more difficult, and frustrated parents often let scheduling fall behind or give up. This often results in further disruptions in a child’s life and can require more costly interventions. D2C telepsychiatry is quickly becoming a fundamental part of the solution to improve behavioral health access for children and adolescents, both at home and in schools. Powered by videoconferencing technology, these models are readily embraced by younger patients because they have grown up communicating via video and mobile devices. Telepsychiatry not only helps normalize mental and behavioral health care with the use of technology, but it also helps breakdown barriers to establishing rapport with children because it gives them a greater sense of control. Interactions with behavioral health professionals can occur from the comfort of home or in a familiar, private setting where they feel safe. In addition, the privacy afforded by these models helps alleviate concerns of running into peers in a waiting room or outside a facility and allows children and adolescents to learn to cope with whatever challenges are at hand in a comfortable setting. Most notably, telepsychiatry opens doors to greater access while also providing a convenient means of scheduling appointments. In an academic setting, for example, staff can connect students with timely and proactive care directly on campus during times that align with their schedules. One alternative school in Pennsylvania, The Lincoln Center, has experienced success with its on-campus telepsychiatry program, which provides mental and behavioral health services to students who need such care on a regular, ongoing basis. Because telepsychiatry providers are available for sessions outside of traditional office hours, parents can avoid missing work, and children do not have to miss school or sit in a waiting room—key advantages to ensuring added stressors are not placed on this age group while they are receiving help. Instead of waiting several months to see a behavioral health professional, children can typically schedule an appointment in less than 2 weeks—and at a convenient time. In 1 instance, a student was at risk of getting expelled from school due to intensifying behavior issues in the classroom. The child’s mother faced significant struggles finding behavioral health support and medication management services. The telepsychiatry option was introduced and quickly embraced by both the parent and child, and now he is stabilized and thriving in the both his home and school environments. Today, children and adolescents face unprecedented challenges and pressures. It’s important that parents proactively track not only a child’s physical well-being, but also his or her mental and emotional well-being. Back-to-school planning is an optimal time to consider a behavioral health check-in, and families and schools are increasingly turning to telepsychiatry as a viable and advantageous approach to better care. The positive effect of telemedicine continues to expand as community stakeholders—both clinical and nonclinical—work to increase access and create efficiencies across a healthcare continuum plagued by provider shortages and fragmented care. Telepsychiatry sits at the forefront of these movements and is quickly carving out a permanent niche in a variety of non-traditional settings. As a natural extension of the telehealth phenomenon, telepsychiatry represents the broader industry trend of moving care outside the walls of inperson clinical settings. When care meets individuals where they are, it not only becomes more convenient, but also ensures care is more proactive, efficient, and effective. It also has the ability to drive greater patient satisfaction as evidenced by the more than 75% of consumers demanding virtual care and telemedicine access from their providers. To address growing behavioral health needs, community-based care settings are adopting telepsychiatry to provide an effective alternative to costly, unnecessary emergency department (ED) admissions. Telepsychiatry is also now used in a variety of nonclinical settings, such as schools, universities, and correctional institutions. And that’s just the tip of the iceberg as communities find creative ways of using telepsychiatry to meet individuals where they are, and ultimately deliver “whole person” care that promotes greater wellness. More than ever, employers must proactively address employee health to align with the goals of value-based care—better outcomes and lower costs. That’s why many organizations like the Employee Assistance Program (EAP) for Bon Secours Health System based in Richmond, Virginia, are looking to direct-to-consumer (D2C) telepsychiatry models to help bolster behavioral healthcare options. Bon Secours offers an active and well-established EAP to its 9000 employees to improve behavioral health conditions such as depression, anxiety, substance use, and post-traumatic stress disorder. The program supports a variety of population health initiatives and helps employees find appropriate resources following an initial visit provided through the EAP. While rural areas currently suffer from substantial psychiatric resource shortages, larger cities like Richmond are not immune. Prior to referring to telepsychiatry, staff working within Bon Secours’ EAP faced challenges connecting employees to appropriate mental and behavioral health resources in a timely manner. Wait times for appointments reached up to 2 months in some cases, leading to the potential for higher-cost interventions when employee symptoms would continue to exacerbate. 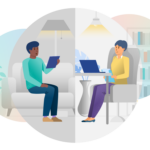 D2C telepsychiatry, offered in the comfort of an employee’s home or other Wi-Fi–enabled private location, proved to be an effective option for filling such gaps. Through the EAP, employees can access online appointments in a matter of days with a licensed telepsychiatry provider, ensuring timelier response and tailored care delivery. Past scenarios often resulted in employees turning to primary care providers (PCPs) for behavioral health assessment or treatment, despite the fact that PCPs often lack specific expertise on such conditions or psychotropic medications. Since starting to refer employees to telepsychiatry, Bon Secours has received positive feedback from young and more mature employees alike. The staff has found that all age groups appreciate the convenience and privacy of telepsychiatry and are not intimidated technology. Many employees have stated they prefer the flexibility of scheduling appointments outside of traditional office hours and are more comfortable seeking out behavioral health services from the comfort of their home to avoid stigma. At a time when behavioral health needs in younger populations are rapidly growing, telepsychiatry models enable staff to connect students with timely and proactive access to mental and behavioral health resources directly on campus and during times that align with students’ schedules. For instance, The Lincoln Center, an alternative school in Pennsylvania, is leading by example through its telepsychiatry program, which provides mental and behavioral health services to students on a regular, ongoing basis. The benefits of telepsychiatry are far reaching, and 1 of the most significant impacts of these models is their ability to provide real-time support and assessment when individuals are in higher acuity or crisis situations. In line with the strong push across the industry to meet people where they are, telepsychiatry helps circumvent the need for ED visits by providing real-time assessment via videoconferencing. St. Joseph’s Villa, a nonprofit organization in Richmond, Virginia, that serves children with special needs and their families, is making major strides to address the inadequate access to psychiatric care in the area. By leveraging telepsychiatry to provide crisis stabilization services for vulnerable child and adolescent populations, the program aims to divert individuals in need from costly, unnecessary hospitalization. Since implementing telepsychiatry in 2014, the program has served nearly 500 children in their crisis stabilization unit, diverting nearly 90% from the ED. Many communities are also turning to telepsychiatry in efforts to enhance existing crisis management services and better serve individuals in psychiatric crisis in their own homes. By arming mobile crisis teams with videoconferencing technology during inhome assessments, individuals in need can be connected to mental health providers to receive specialized care in real-time via iPad or other similar technology. These models are rapidly expanding across the country as communities aim to more effectively utilize local resources and avoid high-cost hospitalizations. One of the nation’s first models of remote crisis behavioral health care, launched by Access Services—a nonprofit organization that specializes in improving the quality of life for people with special needs—in 2014, has seen success with the program as an effective approach in addressing the growing behavioral health provider shortage impacting the area. Similarly, some innovative communities have started equipping first responders and police officers with telepsychiatry to virtually “bring” psychiatrists or mental health screeners with them via iPad to assess and manage the situation in real-time. The ultimate goal is to determine the best course of action and direct individuals in crisis to the appropriate type of care from wherever they are, potentially preventing adverse outcomes for the individual and the community as a whole. As communities embrace this reality, consumers will benefit from a less fragmented healthcare system that delivers care directly to where they are. Nonclinical settings are wise to consider telepsychiatry as an effective means to bolster behavioral health access and drive better care outcomes across the board. There is good reason why telemedicine is rapidly reengineering the way communities think about care delivery today. At a time when payers and providers are grappling with how to efficiently and effectively make the leap to value-based care, telemedicine is helping the industry turn the corner to deliver better access to care and coordination of care at a lower cost. A recent Forbes article noted that this movement has had the most impact on the behavioral health sector. Telepsychiatry models, provided through video conferencing platforms, are removing barriers associated with growing staff shortages, cost, location, and stigma. Access to care is no longer defined by the limitations of office hours, and patients appreciate the convenience of accessing care from the comfort of their own home. Recent policy and legislative movements suggest growing acceptance of telemedicine as a mainstream form of care. The majority of US states have enacted or proposed some form of parity law regarding insurance coverage. In line with these trends, telepsychiatry is experiencing unprecedented growth, not only in terms of the number of users, but also the innovative ways that communities are incorporating these models into care delivery. Telepsychiatry is helping communities address growing psychiatric provider shortages. Currently, all US states have unmet psychiatric needs, and 60% of US counties lack a single psychiatrist. The outlook for psychiatric specialties, such as child and adolescent psychiatry, is even more critical. In response, many community mental health centers and outpatient clinics have turned to telepsychiatry to supplement their provider capacity and increase access to specialists. These telepsychiatry providers often do everything an in-person provider would do—they serve a normal caseload of patients, participate in treatment team meetings, and oversee other clinicians—all through telehealth. Molina Healthcare, a managed care organization based out of Long Beach, California, applied this model in a different way. Like many, Molina has understood the importance of bringing behavioral health expertise and care for residents at skilled nursing facilities (SNFs). Today, Molina has a program where 4 SNFs share a regularly scheduled block of time with a telepsychiatrist. With this model, residents receive care in a setting where they are comfortable and don’t have to travel to an appointment, and the psychiatrist benefits from greater clinical awareness of a resident’s behavior in the facility. Additionally, direct-to-consumer telepsychiatry is expanding referral options in communities where psychiatric resources are lacking, providing a lifeline for under-resourced clinics and primary care providers. Lengthy wait times for appointments often cause patients to rely on their primary care providers for their psychiatric needs or opt to forego care altogether. The reality is that more than half of psychiatric drugs are prescribed by non-psychiatrists, although many primary care providers lack specific expertise on psychotropic drugs. A growing body of evidence points to the effectiveness of telepsychiatry models and high patient satisfaction in a variety of settings. One literature review found the use of video conferencing models expedited access, decreased work absences, enhanced confidentiality and privacy, empowered patients in their care, and reduced the risk of hospitalization. For these reasons, telepsychiatry models are increasingly incorporated into care models across the health care continuum. For instance, professional psychiatric shortages often slow down triage of emergency department (ED) patients presenting with a behavioral health crisis. It is not uncommon for hospitals to board these patients in the ED or tie up a hospital bed until a psychiatrist is available to make a psychiatric assessment, increasing costs for all stakeholders. Many EDs now leverage telepsychiatry models to relieve this pressure, ensure timely evaluation, and triage to the most appropriate level of care. Notably, a North Carolina statewide telepsychiatry initiative that implemented telepsychiatry in 18 hospital EDs found that 88% of consumers agreed or strongly agreed that they were satisfied with the service. Telepsychiatry is also used in some inpatient units to augment in-person staff and ensure that a unit has 24/7 psychiatric coverage for patient evaluations. Additionally, discharge planners—whether associated with a hospital or residential program—must often work within a restricted timeframe to connect individuals with appropriate services. Since psychiatry wait times in some communities can range between 3 and 6 months in many cases, telepsychiatry options open up a vital link to providers and help limit the potential that a patient’s condition will deteriorate back into a crisis situation. Outside of hospitals and other typical care settings, telepsychiatry models are starting to be used in school and university settings to improve access to care and meet students where they are. A study, published by Child and Adolescent Psychiatric Clinics, evaluated satisfaction rates of students who received services through a rural school-based telehealth center and found an average satisfaction rate of 93% among students and 97% among parents. Telepsychiatry is transforming access to behavioral health care at a time when the need is critical. Communities are wise to consider effective telepsychiatry partnerships that can bolster behavioral health service options to improve access to care across the continuum, drive better outcomes, and lower costs.